The lines “Vietnamese troops are going and have a common will to save the country…” can’t be uttered out loud but it doesn’t matter as the words are sung in the heart and expressed through the eyes and hands. 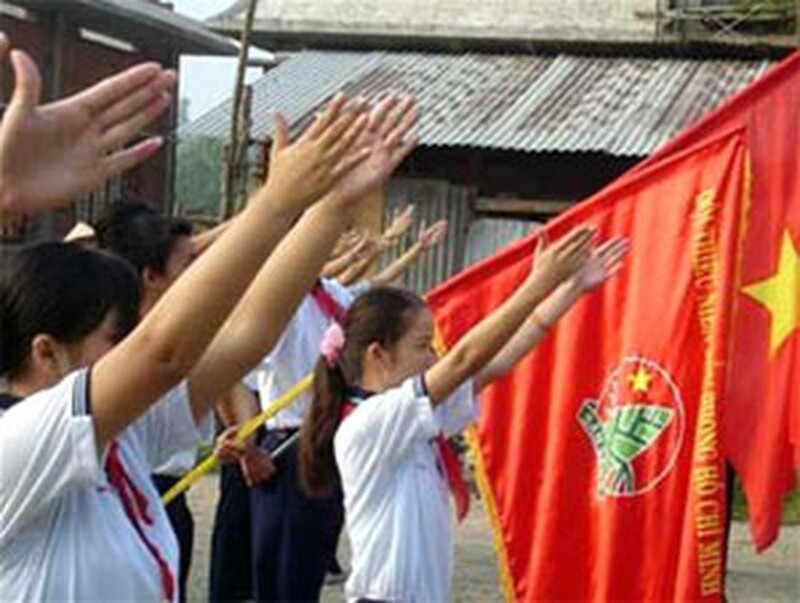 For the past four years, deaf and dumb pupils have saluted the Vietnamese flag and “sung” the national anthem every Monday morning in their own special way. At six-thirty, more than 100 pupils gather in the schoolyard of the Disabled Children’s Center of Dong Nai Province in a suburb of Bien Hoa. They come to school earlier than usual. They are quiet and look rather formal in their uniforms of white shirts and blue trousers. You can tell they take it seriously because their shirts are tucked in. The pairs of arms move rhythmically to the music. Who says the dumb cannot sing? Ordinary people belt out the national anthem through their mouths, whereas the dumb sing with their arms. To hear them properly, you must listen with your eyes and your heart. They use sign language and other physical images that are very close to everyday life. If the left arm is stretched straight down and the cupped right hand goes from the left hand to the shoulder, it means “troops”. When they use two fingers to create an “S”, everyone knows straight away they mean Viet Nam. And the idea of “forward” is conveyed by two upward palms rising up the chest. There have been occasional glitches performing the national anthem this way. One was when the cassette player broke down and the music stopped suddenly. Because they couldn’t hear, the children kept on with their passionate rendition. When some of the kids realized what had happened, they burst out crying. Even though they couldn’t physically detect the absence of backing music, they were nevertheless aware of the sound gap. The center’s director, Le Thi Hieu, is always concerned about this sound gap. She remembers the days when the kids would stand there motionless while the national anthem played and her heart went out to them in pity. On a working trip to the Philippines in 1999, Ms. Hieu observed deaf and dumb Filipinos singing their national anthem, and the idea of doing the same for Viet Nam popped into her mind. She thought deaf and dumb children in Viet Nam were missing out by not fully participating in the salute to the flag. They needed a way of performing the national anthem that would get around their physical affliction. When she returned home, Hieu and a teacher started learning the sign language taught in other schools and also created some themselves so that they could compose a national anthem expressed in signs. Writing the anthem proved hard, and teaching the children how to perform it even more difficult. First, the teachers had to explain the concepts of “Fatherland” and “homeland” to the first and second graders using sign language. All in all, it took two months before the kids could perform the anthem confidently. Recalling the first day when the pupils sang the anthem, teacher Nguyen Thi Ngoc Trinh looks deeply moved. “So holy! They were no longer cut off from the world. They did it incorrectly the first time, but it didn’t matter, they did much better the second time, third time…,” she says. Asked why he likes to sing the national anthem, Chuong puts one hand over his heart and draws the letter “S” in space with the other hand.